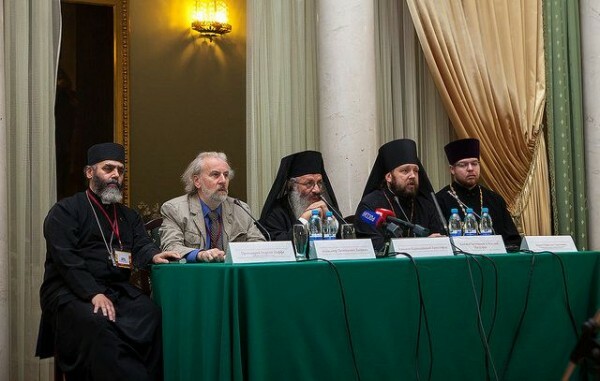 On 18-20 September 2014, the 7th International Conference on Religions and Destructive Cults took place at the Holy Trinity and St. Alexander Nevsky Laura in St. Petersburg. Taking part in the conference were representatives of the Russian, Georgian, Bulgarian, Polish, Romanian Churches, and the Churches of Cyprus and Greece. The conference was held earlier in various Orthodox countries.This time it took place in Russia under the auspices of the Moscow Patriarchate’s Department for External Church Relations. Among the delegates of the Russian Orthodox Church were representatives of the Byelorussian and the Ukrainian Orthodox Churches. Discussed at the sessions and meetings were the ways to escape the influence of totalitarian organizations. Metropolitan Varsonofy of St. Petersburg and Ladoga, chancellor of the Moscow Patriarchate, sent a message to the guests and participants of the forum. Bishop Mitrofan of Gatchina and Luga greeted all those present, noting the topicality of the theme of the meeting. Bishop Christoforos of Karpasia expressed the words of gratitude to His Holiness Patriarch Kirill for giving the blessing to arrange the forum. He noted that the issue of combating sects is not farfetched, but vital for the modern world, as it affects not only the church circles, but the whole society. That is why, Bishop Christoforos emphasized, present at the meeting were not only clergymen, but also scholars and lawyers. “Most sects act in disguise. They aim to destroy human personality, but the Church wants to protect human dignity by love and care and to lead people to the true path of hope and salvation,” Bishop Christoforos said. Mr. Alexander Dvorkin, President of the Saint Irenaeus of Lyon Centre for Religious Studies, emphasized that the conference bore witness to the unity of all Orthodox Churches in their attitude to that problem. According to Bishop Mitrofan, the Orthodox Church may cooperate with representatives of traditional confessions in opposing cults, because Russia is a multiethnic and multiconfessional country, and its people have the same moral values. The conference was organized by the inter-Orthodox action group for studying religions and destructive cults, the diocese of Gatchina, the Missionary Department of the diocese of St. Petersburg, and the Stavros Apologetic Centre.